ShadowProtect Desktop provides fast and reliable disaster recovery, data protection and system migration to get desktops and laptops online as quickly as possible. ShadowProtect includes bare metal recovery to the same system, dissimilar hardware or to and from virtual environments. Protect everything on your desktops and laptops: operating systems, applications like Microsoft Office, configuration and personal settings as well as your data. More and more businesses are becoming less centralised as people increasingly rely on laptops as their computing environment. In addition, many small businesses are using desktops and laptops to run their organisations. Losing a system – whether to loss, theft, damage or malicious virus attacks – can be catastrophic to many businesses. That’s why so many IT organisations are making data backup and disaster recovery a priority for their desktop computers. ShadowProtect Desktop is an automated backup that works in the background. In the even of a disaster, its flexible recovery options allow you to complete granular recovery of files and folders or full bare metal recovery in a matter of minutes. Hardware Independent Restore (HIR) technology makes it quick and easy to recover to the same system, to dissimilar hardware or to and from virtual environments. ShadowProtect’s HIR feature also makes system migration to a new desktop or laptop or consolidation to virtual environments a straightforward process. 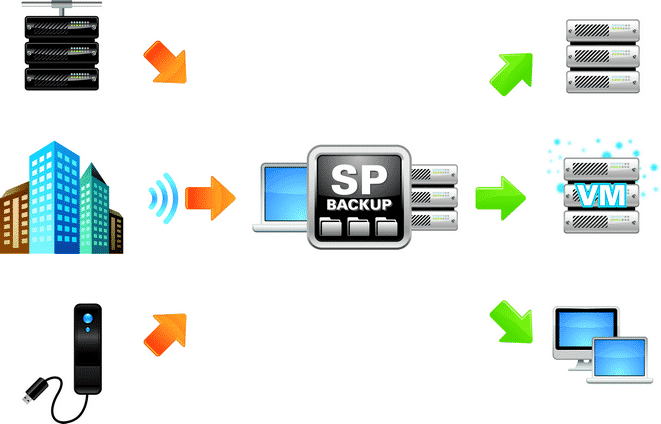 ShadowProtect gives you the tools you need to centrally manage your backups and resotre them in a matter of minutes. The easy-to-use management console allows you to install ShadowProtect to all your Windows desktops and laptops from a central location, and view the backup status of all protected Windows systems in your organisation.